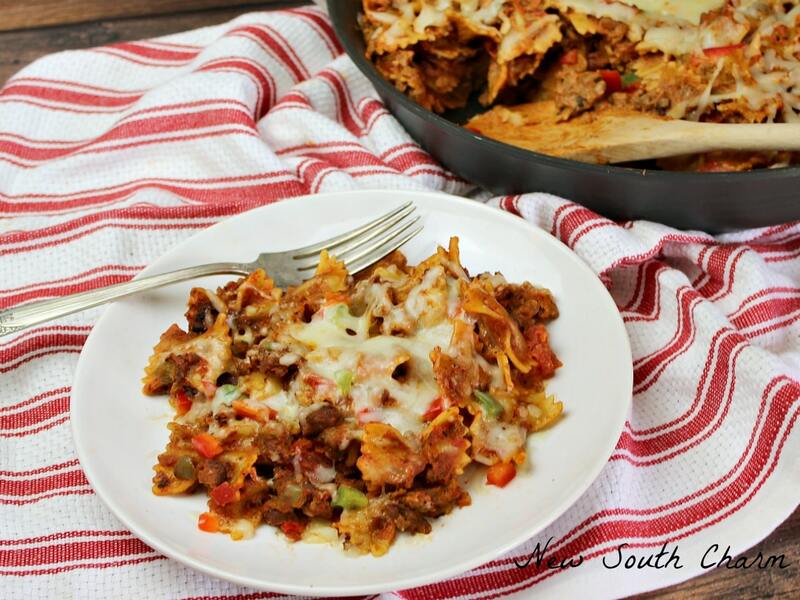 It’s been a while since I’ve shared a casserole with y’all. 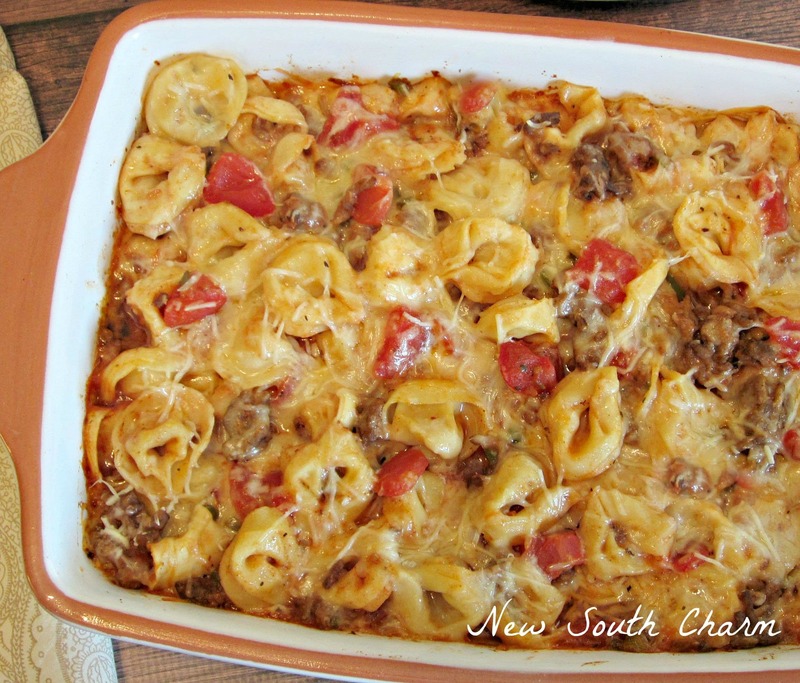 So today I’m sharing a great one; Easy Three Cheese Tortellini Bake. It’s so good you’re going to want to lick the plate. 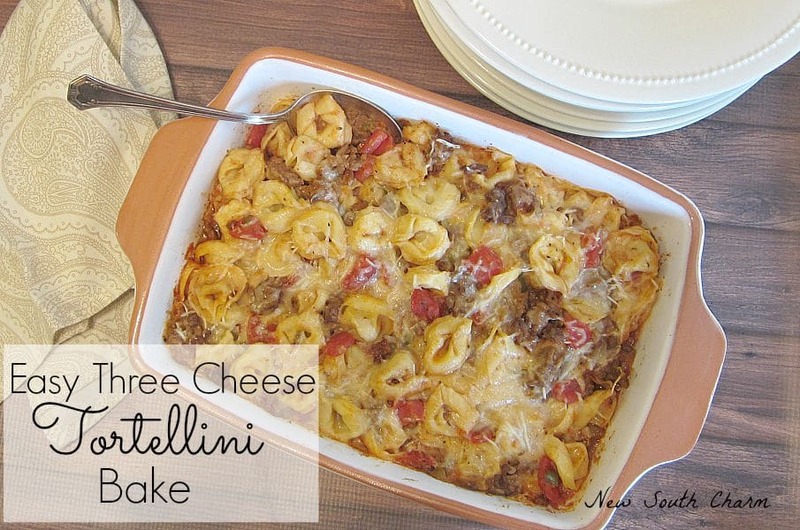 Three different kinds of cheese take this tortellini bake from good to great. This recipe has Parmesan, Mozzarella, and Romano cheeses. If you’ve been following along with me for anytime at all you know that I have a deep and abiding love for cheese. I mean it’s almost an obsession. I wonder if there’s a support group for cheese lovers? Honestly, I don’t remember where this recipe came from I just know that it’s one of my favorites. I just love how full of flavor it is. I also love how easy it is to make. One of the things that makes this recipe so delicious refrigerated pasta. It has a much fresher flavor than dried pastas. For this recipe I use cheese tortellini but you could use beef or spinach if that’s what you prefer. At my local grocery store I find it in the pasta aisle in a small refrigerated case. If you can’t find refrigerated pasta frozen works just as well. Just follow the directions on the package for preparation for either choice. 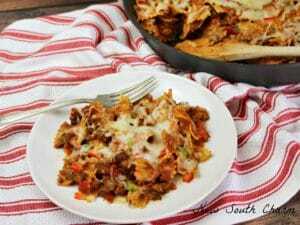 The meat sauce is the best part of this recipe in my opinion. I love how it’s seasoned and how full of flavor it is. Seasoning is probably one of the most important parts of making any Italian dish. This recipe isn’t any different the seasoning is what makes it so delicious. Oregano and garlic are used in pretty much every Italian dish. This recipe calls for a lot of garlic. Four to five cloves finely minced to be exact. You might think that’s a lot of garlic but trust me you’ll love it. I mean how could you not there’s pasta, cheese and garlic. Do you love Italian food? Or do you prefer Mexican? Maybe Chinese? 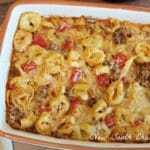 While Tortellini is cooking in a large skillet melt a table spoon of butter and brown beef add onions, peppers, and garlic cook until beef is browned and vegetables are tender. Drain fat. 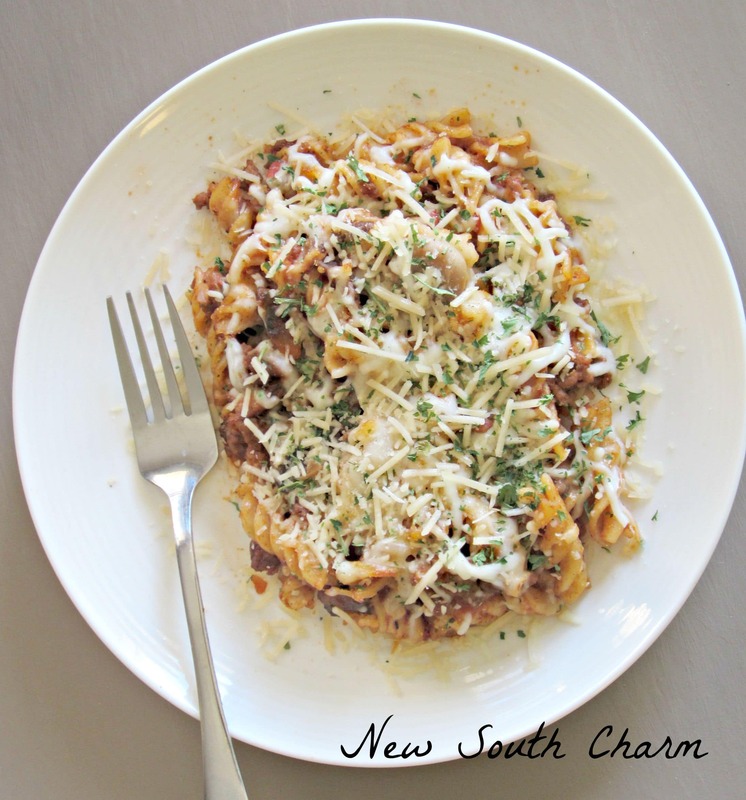 Looking for more great pasta dishes? Yum! You had me at three cheese. lol Definitely pinning this. Sounds amazing! We love torellini in our house. This recipe is getting pinned for sure! Thanks Sinea! 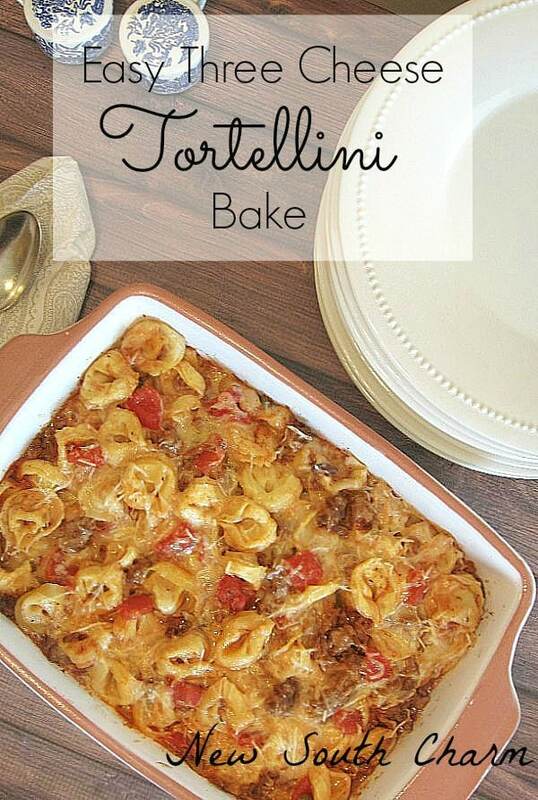 We love tortellini here too! There are few things I love more than cheese! Yum! Thanks for sharing. I know cheese makes everything better! Thanks for stopping by! Sound sooo good! I need to make it one day! Wow! This looks so yummy. My family loves all the flavors here. Pinning and stumbling! 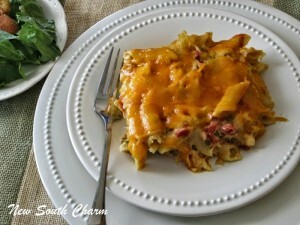 Your recipe looks so good, I would say a comfort food!!! All the cheeses would make great flavor! Thanks Christine! I love Italian Food too. Thanks for pinning! This pasta looks so delicious! So glad you shared. It has been pinned to my pasta recipes board! We will just love your Three Cheese Tortellini, so full of comfort! Hope you are having a great week and thanks so much for sharing with Full Plate Thursday. This looks so divine! I know the kids will love it. They’re big pasta fans, and this dish is something they would enjoy. Pinned and stumbled! Thanks so much for sharing with us at Funtastic Friday. This looks delicious! 🙂 Thanks for sharing at Women With Intention Wednesdays! It is sooo good. I hope you try it and come back to tell me what you think. Thanks Miz Helen! I’ll be stopping by to get my plate! I love a meal like this. Italian food is on the top of my list when it comes to foods that I love. All of this cheese is great. I love cheese, can’t wait to try this recipe! Thanks for sharing!